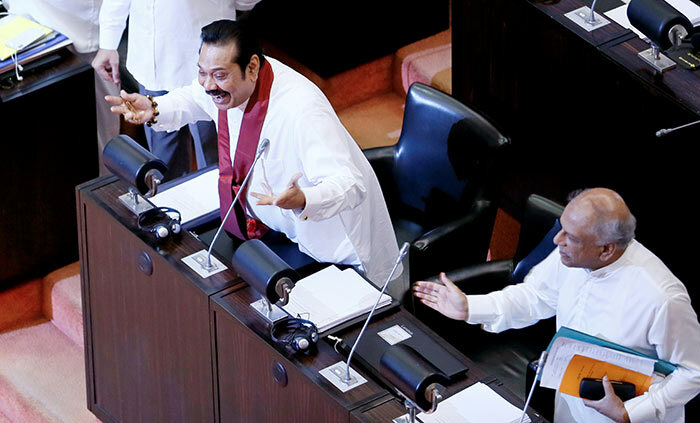 Sri Lanka’s newly appointed Prime Minister Mahinda Rajapaksa, who lost two motions of no confidence last week, may lose his government’s budget even as he clings to power. The Fake PM travels from Wijerama Mawatha residence to Parliament in an Air Force Helicopter! Two brand new Bullet proof Range Rovers are being air freighted from the UK for the Fake PM’s office for electioneering purposes. The Pollonnaruwa Pambaya has converted our Nation into Mugabe’s Zimbabwe in less than 3 weeks. What an achievement! All the motions happened to be so far not legal. You mean like the fear all Sri Lankanshad during thr war. Sri Lankans dont kiss the fert of the thugs but lick the feat of the ehite men. No pne seems to remember who helped my3 to become president. No one seems to wsnt to remember the Central bank robbery. RW is such an angel so lets hope he gets back to rob the country and sell every thing. Sri Lankans are dignified people. We fostered this Pollonnaruwa Pambaya because he was promoted by the Late Ven Sobitha. The Rajapaksa excesses were biting society and we humbly put up with that following conclusion of the war. The Rajapaksa eliminated the Tamil Terrorists, true, but that does not give them a licence to loot national wealth and tetra all citizens as crooks and send white vans and murderers to clear whom they did not like. Now this Polonnaruwa Pambaya who promised to be a one term President is lapping his lips at the wealth he has made and at the wealth he is likely to make in his second term. He is challenged by RW’s presence; he is believing RW has and will curtail his obnoxious greed for wealth. The Country is heading to disaster; it is already a PARIAH STATE. All because of the greediness of the Polonnaruwa Pambaya and his family. Fiery. I agree with your comments. How ever Rw is also responsible for supporting the idea of turning a Gamarala in to a president. Unfortunately RW and every one else who supported the idea under estimated My3’s level of greed. At the end of the day My3 played all of them. Dinesh Gunwardena is the fox son of Boralugoda lion. He has no any ethics in parliament-asked the majority in selection committee. Dear friends, your comments appears to be based on pro/con corruption, wastage,negligence and ignorance etc. These comments, however correct have created antipathy within reasonable people towards entire political system in S.L.. I don’t think characteristics of good governance other than Rule of Law are sufficiently taken up. According to my perception, Comments should require strategic aspects for strengthening / straightening entire system including political system. Accusing each other won’t help solving the crisis but consolidation of already corrupted status-quo. Don’t you think so ?